Nivedhan Naysaduray, Vineeth Suresh, Vijay Karan, and Sarah Parmar have an average age of just 24 yrs, but already these young millennials have cemented themselves as entrepreneurs in Malaysia’s start-up node, Bangsar. 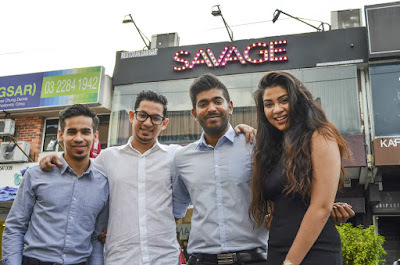 The young and dynamic ensemble, recently joined Malaysia’s ever growing entrepreneur circle with the launch of SAVAGE, a bar that brings an edgier feel to Bangsar’s nightlife scene. The streets of Jalan Telawi welcomed its latest addition on the 20th of November 2016. Savage, with its unmistakable purple hue, was the brainchild of its four enterprising founders who were inspired to turn their love for the food and beverages and entertainment industry into an avenue where they could share their passion with fellow party-goers. SAVAGE offers patrons with a cosy set-up, entertaining music, and drinks at bargain prices that make it an ideal spot to relax after-hours. “From the get-go, we set-out to create a venue that can be enjoyed by those who share our love for hip-hop, R&amp;B, and old school music. When it comes to our menu, we offer an assortment of beverages that satisfy the wants of those who look to us as a spot to socialise and have a great time,” said Vineeth Suresh, Director of SAVAGE. SAVAGE’s operating hours are from 6:00pm to 2:00am and those looking to make reservations or want to find out more about SAVAGE, can do so by visiting its official Facebook page at https://www.facebook.com/savage.bangsar/ or contacting them directly at +6016 238 3090.